Most people hate covering a model. While it’s not my favorite thing, I’d rather be out flying, I think I enjoy putting the covering on more than actually doing the building. I’ll admit it is frustrating and I’m not good at it. I often get to the point of frustration where I shortcut stuff or don’t do things correct because I just want it done. However, in my eyes covering is more like actually completing the model. When it is covered it is ready to go! I decided to go with Ultracote Lite covering. It is a great covering material. The more time I spend working with it the more I like it than regular Monokote. I’m not great at covering by a long shot, but to me it seems easier to apply than Monokote. Ultracote Lite is pretty light weight. The elevator came in around 3.5 grams. My scale doesn’t do tenths of a gram but depending on how I sat it on the scale it would read either 3 or 4 grams. All the tail feathers along with the vertical stab and rudder. I thought I ordered red instead of purple, but I like the look of the blue and purple combination. I started with tail feathers because they’re small and easy to work with. 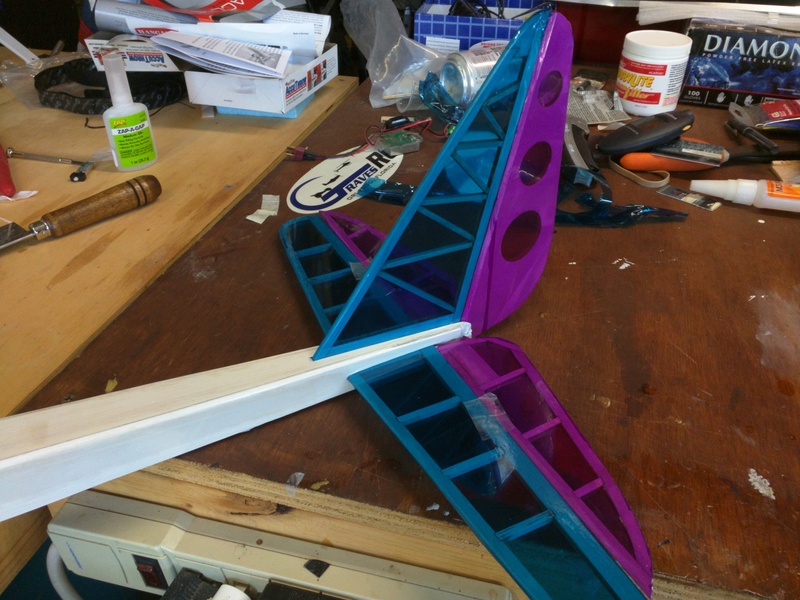 I also figured that it would be better to learn how to deal with the curved edges here than on the more important piece, the wing. I was actually surprised by how much strength the covering gave these parts. I’m really looking forward to completing the wing because as it sits right now it seems so fragile. Just had to see what everything looked like on the fuse! I’m using three colors for this build, white, blue, and purple. I got the transparent version to make sure they’re the lightest possible. Covering the fuse was a little more difficult than I thought. I had a couple of mess ups where I didn’t realize how the covering was going to end up at the end and had to make some cuts and overlaps. I also hit an area on the fust and rudder with too much heat from the heat gun and it pulled away. I had to recover those sections. I’m not trying to get a show ready plane, but it was a little disappointing. I thought covering the wing was going to be easier than the tail feathers. I was wrong! The covering doesn’t like the carbon rod for the leading edge. It doesn’t stick as well as it does to balsa. I also made mistakes with adding in the white stripes and the servo cover. I’m glad I’m doing this on a cheaper “learning” model! I just hope it flies when I’m done! Tagged Build Thread, RC, RC Aircraft, RC Plane. Bookmark the permalink.